The 2016 New York Comic Con had all the fun stuff one comes to expect from this annual celebration of all things geek: Movie screenings, parties, people running around in elaborate costumes, and more comic books that any human being could possibly buy. There was also a more serious — but still fun and often funny — conversation going on, throughout the convention, about efforts to make geek culture more inclusive, and the ugly backlash coming from angry white men who think they have a right to control all things geek. It can be a depressing topic, but by and large the tone was upbeat. Over and over again, advocates for greater diversity emphasized their faith that the geek world would get this right, even if there's a lot of work to be done to get there. Thursday afternoon, Blastr hosted a panel titled "Women In Geek Media — The Saga Continues", and a sense of buoyant optimism prevailed. When she started as a writer at IGN, writer Sarah Kuhn said, "I felt I had to constantly justify my existence" as an Asian-American female geek. But, she continued, "in the last 5 or 6 years, things have really turned around." "We're not fighting to say we exist," she added, explaining that the reception for her book about Asian-American superheroes, "Heroine Complex," has largely received a positive reaction. "Science fiction was always ahead of the curve," the much-decorated sci-fi author Connie Willis argued. Even the past two years of the science fiction world's popular Hugo Awards — which have been dominated by reactionaries calling themselves the "Puppies", who set out to game the nomination process to shut out authors who are perceived as too liberal or pro-diversity — should be understood in this context of forward momentum. The Puppies "liked it in the good old days, when it was all white men," Willis said, and their efforts to control the ballot are an attempt to turn it back to those days. But, as she noted, they were largely unsuccessful, as the Hugo voters continued only to vote for winners based on "the quality of the work", and voted "no winner" in categories that didn't have a quality nominee to vote for. Willis rejected the notion that social media is to blame for reactionary forces like the Puppies. "People will come up to you and say the most remarkable things to you in person," she said. She recounted a story from her early days as a writer, when a man walked right up to her at a convention and accused her of sleeping with men to get her endowments. Later that night, another panel, titled "Afropunks & Blerds," took the conversation about diversity to the next level. It was a panel packed full of luminaries, including Vernon Reid and Corey Glover from the late '80s-era metal band Living Colour, discussing how the black subcultures named in the panel title continued to make inroads at being the safe space to just be yourself that every geek longs for in her heart. Afropunks and bleeds are "black folks who refuse to be confined by the narrow roles society says black people belong to," David F. Walker, who has written both Shaft and Luke Cage comics, explained. "We have to continually give ourselves permission to be who we are, no matter what," Reid said, after describing how much pushback he's received over the years being a black man who wants to play rock music. The panelists repeatedly celebrated the imaginative power of sci-fi, and its potential to create a space for exactly this sort of unapologetic self-definition. "If you want to be yourself and see yourself, create something," Karma Horne, a freelance film editor who was moderating the panel, argued. Associate professor of visual studies John Jennings cited sci-fi writer Octavia Butler as an example, saying she "was very much about writing us into the future," and saying that we are currently witnessing a surge in the "black speculative arts movement". Horne concurred, noting that Artist Alley, a room in the convention where various artists get to hawk their wares, had more diversity both in the artists and the art than she recalled from years past. This surge of interest in diversity and in social justice themes hasn't passed the attention of some of the bigger entertainment companies at the convention trying to drum up enthusiasm for their products. Netflix has already made inroads with a feminist superhero series called "Jessica Jones" and the latest offering, "Luke Cage," which addresses issues of police violence and gentrification of historically black neighborhoods like Harlem. Hulu, one of Netflix's biggest competitors, is also making its move in this department, adapting Margaret Atwood's feminist sci-fi classic "The Handmaid's Tale" into a series to be released in 2017. 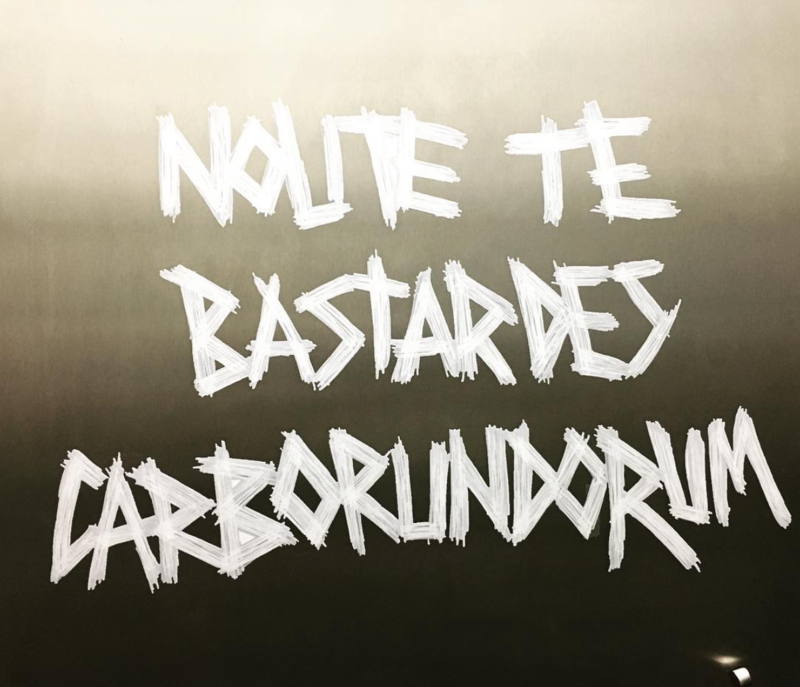 To get buzz going about the series, Hulu plastered the women's bathrooms with stickers that read, "Nolite te bastardes carborundorum." To fans of the book, the words are instantly recognizable as the faux-Latin phrase the main character, Offred, finds scratched in the wall of her closet by the previous handmaiden who lived in her room and died by her own hand. It means, "Don't let the bastards grind you down" and is a symbol of the quiet resistance people show to oppressive regimes. "We came to Comic Con to start a conversation," Lindsey Pearl, head of social media at Hulu, told me in the hallway at the convention. "To start a conversation with the fans of Margaret Atwood, with the people who love the story and know it so well, to get them to understand that we love it, too. And that we see them." Pearl agreed that the previous adaptation of the novel, a movie released in 1990, has not gone over well with fans of the book. But now, with feminism being a hip topic of conversation again, the time has come to take another shot at getting it right. "It's a watershed time for conversations about gender and politics," Pearl said, "and we have to get it right." Getting it right matters, but Hulu's production company is lucky in their potential audience. Folks at New York Comic Con are optimistic that getting it right is possible, even likely, and eagerly look forward to more books, shows, and movies that address their desire to see greater diversity and themes of social justice.